I guess for those Paris Hilton-type girls, a dog is just an accessory. 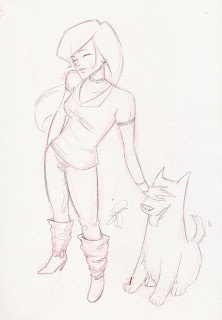 In this week's sketch, I drew in the dog so that the girl's hand is not floating in space. Kinda the same idea, non? I did very little to clean up this quick drawing. 15 minutes to lay down the red and then another 10-15 minutes using pencils to draw out the general curves and shapes. After opening the drawing up in Photoshop, I puzzled for a moment as to what that random streak on the puppy's leg was... The tip of my red pencil had broken off and was caught in the sketchbook. It fell out while scanning.